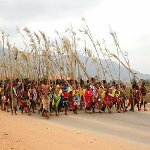 Umhlanga, or Reed Dance is one of the best known cultural events in Swaziland. The festival lasts for 8 days and it's observed around the last week of August / the first week of September. Umhlanga was created in Swaziland in the 1940s under the rule of Sobhuza II. He adapted the ceremony of the festival from the umcwasho ceremony, that is another old cultural practice in Swaziland. Only maidens, who reached the age of marriage and preserved their chastity, participate in the Reed Dance ceremony. Reed Dance is mostly a private ceremony. The first five days of the festival are spent for organizations and preparations. The first dancing ceremonies begin in the afternoon of the sixth day. The dancing ceremony is continued on the next day, when it's attended by His Majesty the King. Also starting from this day the visitors of the country may watch Umhlanga. The last day of Reed Dance is marked with the slaughter of cattle (usually 20-25). Every maiden gets a peace of meat and goes home. The last two days of Umhlanga are public holidays in Swaziland. Every year the exact dates of the festival are appointed, according to the ancestral astrology.